Jammu and Kashmir Bank recruitment 2017-2018 | Clerk PO and SO Vacancies. Apply online for Jammu and Kashmir Bank recruitment notification 2017-2018 for freshers. Jammu and Kashmir job openings in India for the vacancies of Clerks PO’s Specialist officers and Managers. Interested and eligible candidates can apply online for Jammu and Kashmir careers through registration link provided below and can go through previous papers and Syllabus of the related or various bank which are available on our website. We are providing all latest Latest Bank Jobs 2017-2018 on our website All India Jobs. So bookmark this page for latest updated information about the banking sector. The Jammu and Kashmir Bank intends to recruit career oriented candidates for filling up Clerk PO and SO vacancies. Freshers and experienced candidates who are waiting and eligible for this opening can take this as a challenge and apply for the recruitment as given below. Candidates can go through Previous Papers and Syllabus of other Government Jobs which are available on our website. Candidates who are eagerly waiting for this Bank opening was step forwarded with various job openings. Candidates can practice Jammu and Kashmir Bank previous papers to crack the exam and can go through the Jammu and Kashmir Bank Clerk PO and SO Syllabus and Exam pattern. so this will help you to clear the preliminary and mains exams.Here you can find latest job updates of Jammu and Kashmir Bank. The Jammu and Kashmir Bank was founded on 1 – October – 1938 under letters patent issued by the Maharaja of Jammu and Kashmir, Hari Singh. The Raja had invited the eminent investors to become the founding directors and shareholders of the bank. The most notable of which were Pandit Srinivas Magotra, Abdul Aziz Manteo, Pesten jee and the Bhagat Family, all of whom acquired major shareholdings. The bank commenced the banking business on 4 July 1939 and was considered the first of its nature and composition as a State owned bank in the country. The bank was established as a semi-State Bank with participation in capital by State and the public under the control of State Government. In the year 1971, the bank had acquired the status of a scheduled bank and was declared as an “A” Class bank by the Reserve Bank of India in 1976. The bank had to face serious problems at the time of independence when out of its total of ten branches two branches of Muzaffarabad, Rawalakot, and Mirpur fell to the other side of the line of control (now Pakistan-administered Kashmir) along with cash and other assets. Following the extension of Central laws to the state of Jammu & Kashmir, the bank was defined as a government company as per the provisions of Indian companies act 1956. Dr. Haseeb Drabu was chairman and CEO of the bank for the period 2005 to 2010. sal bank in Jammu & Kashmir and as a specialized bank in the rest of the country. It is also the only private sector bank designated as RBI’s agent for banking business, and carries out the banking business of the Central Government, besides collecting central taxes for CBDT. It is the sponsoring bank of J&K Grameen Bank. Go to the Official website of Jammu and Kashmir Bank. If you need more details about Jammu and Kashmir Bank Recruitment, check the official website. 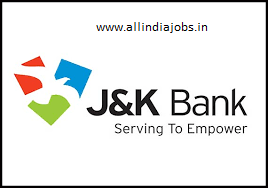 Dear job aspirants, get latest notifications related to Jammu and Kashmir Bank Recruitment 2017-2018 by visiting our website www.allindiajobs.in regularly. Also, you can bookmark this page.